This beautiful sectional will be a comfortable centerpiece in your casual living room or family room. This configuration is made up of a left arm facing one arm love seat recliner, wedge unit, armless chair, and right arm facing one arm love seat recliner. The sectional features high plush back cushions and deep welted box seat cushions that will keep you cozy. Framed by welted flared arms, and a reclining seat at each end, this piece is both stylish and practical. The sectional is available in multiple fabrics be special order, so you are sure to find an option that fits your needs and matches your decor. This item is available in a standard reclining sectional sofa option or a powerized reclining sectional sofa option. The Megan Powerized 4 Piece Sectional Sofa by Lane at AHFA in the area. Product availability may vary. Contact us for the most current availability on this product. 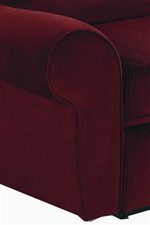 343-03 Armless Chair 1 23" 41" 40"
343-90 Powerized RAF 1 Arm Loveseat With Recliner 1 57" 41" 40"
343-04 Wedge 1 51" 41" 40"
343-91 Powerized LAF 1 Arm Loveseat With Recliner 1 57" 41" 40"
Arm Flared arm with welts. Padding & Ergonomics All cushions are environmentally safe. At the core of each cushion is high-density, high-resiliency foam, which is wrapped with thick layers of polyester fiber to ensure comfort and durability. 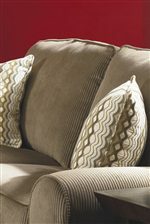 The Megan collection will give your casual living room or family room a comfortable feel. The reclining pieces feature high plush back cushions, and deep welted box seat cushions. Flared arms with welts frame each piece nicely. These pieces will quickly become favorites in your home for their comfort and style. The pieces in this collection are available in multiple fabrics and leathers by special order, so you are sure to find the perfect fit for your home. The Megan collection is a great option if you are looking for Casual furniture in the area. Browse other items in the Megan collection from AHFA in the area.